The Electronic Entertainment Expo (E3) kicked off this year’s show with the ECTO-1 car from the long-awaited "Ghostbusters" game welcoming visitors at the door. Maybe it was a sign of good things to come. The Dares play a live gig at E3 - and online at the same time. The 2009 event breaks away from last year’s corporate theme, which featured a smaller show-floor space and placed an emphasis on individual rooms. This year’s event, although not completely back to the "my booth is bigger than yours" competitions of the past, takes a step in the right direction for showcasing the latest gaming news. 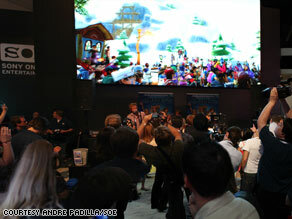 In one rocking example, Jive Records recording artists The Dares took an E3 stage and set a Guinness world record by simultaneously playing a concert at the show and in the virtual world of Sony Online Entertainment (SOE)'s Free Realms. Of the Big Three's opening press conferences, Microsoft trumped Sony and Nintendo by bringing Paul McCartney and Ringo Starr on stage to promote the Harmonix release, "The Beatles Rock Band" (not to mention filmmaker Steven Spielberg, skateboarder Tony Hawk and other Xbox-pimping celebs). Of course, if you have a winning game, you might as well throw a updated number on its title and send it out for battle. The days and weeks ahead we'll see such sequels as "Call of Duty: Modern Warfare 2," "Assassins Creed 2," "Left 4 Dead 2" and "God of War III" hit the shelves. The return of booth babes, the barbed wire-enclosed display for the upcoming "Batman: Arkham Asylum" and Lego-branded games everywhere highlight an expanded, star-studded E3 show that promises to combine Hollywood-like visuals with interactive experiences that will delight your fingers.